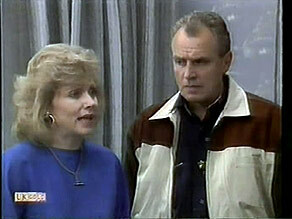 Beverly and Jim decide to separate. 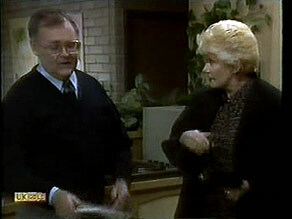 Beverly tells Todd that he'll have to go back to Adelaide to live with his mother. Todd is not at all pleased at the news that he has to go back to Adelaide. He says he can't because of school and Cody. Beverly says there's no other choice - she won't be there and Jim and Helen can't be expected to keep him as he's no relation. Jim says that he'd be happy to keep Todd there, but apparently Todd's mother wants him home with her. Todd wants to phone his mother and tell her about Cody, but Beverly doesn't fancy his chances - last time this happened Todd wanted to stay because of Melissa! Todd says he misses his mother, but he'd like to have the chance to stay. Beverly tells him firmly that his mother and Katie miss him very much - their feelings will be very hurt if he refuses to go home. Josh is fuming about being kicked off the soccer team. Melissa says she'll see Dorothy and try to smooth things over but Josh doesn't think she has a hope. Melissa suggests showing Dorothy the original draft of the essay...except Josh put it in the bin at Cody's house. They decide to try to retrieve it. Madge wonders where to go next with the information about Felicity's dodgy dealings. 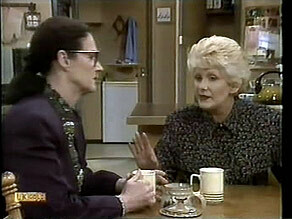 Dorothy suggests caution - that Madge has a quiet word to Felicity before the meeting and drop a few hints. It might be enough for her to keep quiet about the parking ticket. Doug says he'd better chase up Felicity Brent about the work she has for him. Just then Josh and Melissa come in, wanting to look through the bin for his essay. Josh finds his essay, but it's covered in mucky stuff. 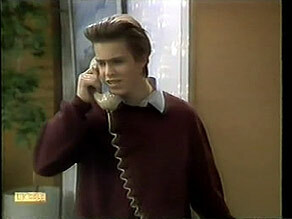 Todd is on the phone to his mother, playing the "I want to stay at school" card. Then he tells her about his friends and Cody. Cody takes the phone. Doug has arranged to meet Felicity tonight. Pam is suspicious about Felicity - she thinks she likes Doug's "boyish charm"
Todd and Cody come in looking very depressed and tell Josh and Melissa the situation. Cody blames herself for chucking a mental on the phone with Mrs Landers. She doesn't want to give up though. CODY: You know what Dad says. Jim and Beverly are looking depressed. Jim says he'll miss having Todd around - they've got quite close over the last couple of years. 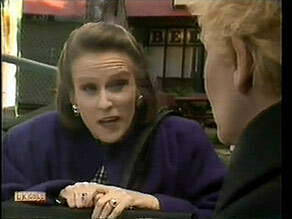 Beverly hasn't been able to speak to Helen since the night she got back - Helen has gone on a trip. 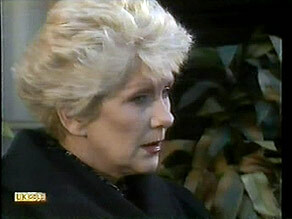 Beverly starts to cry and says she considers Helen one of her closest friends, but now she doesn't want her to know until it's over and Beverly is in Perth. Josh and Melissa have come to convince Dorothy of the truth about Josh's essay. Josh shows her his stained, taped essay draft. 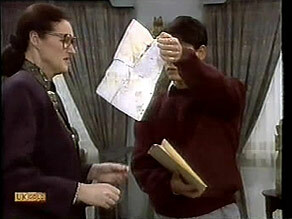 DOROTHY: Honestly, Josh, they found the Dead Sea Scrolls in better condition than that! They explain they had to dig the essay out of the garbage and Dorothy has a look at it. She says the handwriting is too bad to read, so gets Josh to read it out. Doug and Pam are talking about Todd going back to Adelaide. They're sad to see him go, but can't see any way out. Pam says they shouldn't underestimate Cody though(!) They chat about the meeting with Felicity this evening, most unfortunately(!) Pam has a meeting, so won't be there. Madge is having a quiet word with Felicity before the council meeting. She says that if Felicity makes trouble for her over the parking ticket, Felicity could find herself in trouble as well. MADGE: You know the saying about 'Let she who is without sin throw the first stone'? Madge goes one to explain that she has certain information to do with deals and improper conduct. MADGE: I think you know. Madge tells her about the convenient re-zoning of Erinsborough and the clothing contract and Felicity tries to look unbothered. Felicity says that all the council members voted on the re-zoning, not just her, and her husband got the clothing contract through normal channels. MADGE: I see. Well in that case, you won't mind if I bring it up at the meeting tonight. FELICITY: You've got a lot to learn dear. You make an enemy of me and you'll make an enemy of a lot of others on council too. We look after one another and we don't take kindly to newcomers telling us how to run things. You're in way over your head. You take me on, and you'll find yourself so far out in the cold, they'll have to chip you out with ice-picks. Do I make myself clear? Dorothy says they're roughly the same, except Melissa has fixed some grammar and spelling mistakes. Josh doesn't mind losing marks for messiness. He tactfully asks about the soccer team and Dorothy relents - as long as he improves his handwriting too! Felicity has arrived for her meeting with Doug. Pam is on her way out and scowls at her. Des is also there and Felicity does her best to make him unwelcome(!) so he slinks off. Madge is raging about Felicity admitting that half the council are as corrupt as she is. She's bristling at being called a newcomer. Madge says she's going to play Felicity at her own game by getting her own allies...but Harold says she shouldn't stoop to the same level. Harold thinks Felicity is right - Madge is out of her depth. Todd and Cody have come to see Dorothy. They explain the situation with Todd going back to Adelaide. 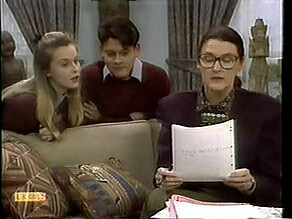 They want Dorothy to write a letter to his mother saying how bad it would be for Todd to leave school. However, Dorothy doesn't think leaving in Year 10 is a major upheaval. 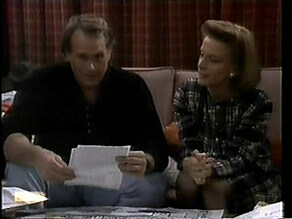 Felicity is discussing her building plans with Doug. She suggests he comes round to look at the house while her husband is away on business. He doesn't look too certain. FELICITY: Just come round to the house. I set great store by the personal factor. FELICITY: Does that surprise you? FELICITY: Look. I'll put this as simply as I can. I like to do business with friends. So...whether or not you get the job depends on how...friendly you're prepared to be. Do we understand each other?